You might think it would be relatively straightforward to tell whether the size of an animal population is shrinking, stable, or growing – but sometimes things get a bit complicated. The end goal of most conservation efforts is to build up the populations of imperiled species to the point at which they can persist on their own without outside help. When it comes to salmon, this could mean using hatcheries to bolster a population, or restoring habitat to allow more spawning to occur in the wild, ideally leading to a stable or growing population. However, it can be challenging to tell if such efforts are working, because assessing populations of fall-run Chinook salmon in California’s Central Valley isn’t as simple as counting how many adults have returned to a given stream to spawn. A process known as “source-sink dynamics” may be concealing the fact that certain populations are not self-sustaining. Much like a reservoir serves as a source of water, a good patch of habitat may serve as a “source population” of fish by allowing the individuals there to successfully reproduce, and their offspring to overflow from the patch into other areas. This movement of individuals from a source population into other areas can mask the fact that patches of poor habitat are acting as “sink populations” where the fish are not successfully reproducing or their young do not survive. This dynamic means that some populations may not actually be contributing to increasing the overall abundance of the species. This is a particularly significant problem for fall-run Chinook, as hatchery-produced fish are often counted in adult returns to wild spawning grounds. In this way, the hatchery population may be acting as a source, and the wild spawning grounds may be a sink. Because not all hatchery-origin fish are physically marked, it can be difficult or impossible to accurately distinguish between hatchery-origin and natural-origin returning adults to understand the natural size of a population. For a population of Chinook salmon to be self-sustaining, estimates suggest a minimum smolt-adult return ratio of 2%. This means at least 2% of smolts must survive and return as adults. A study in the San Joaquin River estimated that the survival of released fall-run Chinook smolts travelling through the Delta was only 2.5% (Buchanan et al. 2018). Based on this estimate, at least 80% of these salmon would need to survive the remaining journey through San Francisco Bay and the ocean in order for the San Joaquin Basin population to be self-sustaining – a rate which is incredibly unlikely. Since so few out-migrating salmon survive to adulthood, this indicates the fall-run Chinook salmon population must be supplemented by returning adults from other sources. Hatcheries on the Merced and Mokelumne rivers in the San Joaquin Basin annually release fall-run smolts into the San Francisco estuary via trucking. 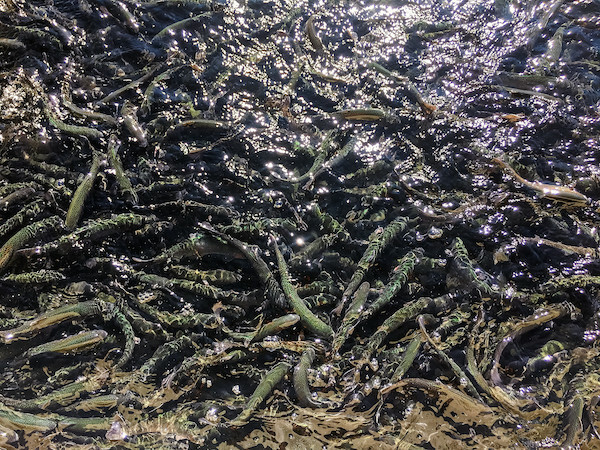 Because trucked smolts are more likely to stray from their natal stream when returning as adults, an unintended consequence of these releases is that hatchery returns can make up more than 70% of adults on hatchery-free rivers in the San Joaquin Basin. Additionally, hatchery-origin adults from the Nimbus, Feather, and Coleman hatcheries in the Sacramento Basin often return to rivers in the San Joaquin Basin. In this way, the Sacramento Basin may be acting as a source, while the San Joaquin Basin is acting as a sink for fall-run Chinook salmon. This dynamic may affect the overall population in several ways. First, fewer adults returning to the Sacramento Basin reduces the number of recreationally harvestable salmon (anglers are permitted to harvest fall-run Chinook in the Sacramento Basin, but not in the San Joaquin Basin). Furthermore, if Sacramento Basin adults return to the San Joaquin Basin, their offspring will experience much lower survival rates, reducing the number of fish available to the ocean fishery and the population as a whole. Finally, the continued loss of fish into sink populations means the entire population may need to be supplemented with even more hatchery production to achieve population and fisheries goals. Self-sustaining Central Valley Chinook salmon populations are the goal of conservation efforts, yet they may be harder to attain than previously thought. If the San Joaquin Basin is acting as a sink, more recovery efforts may have to address low survival rates of juvenile salmon in the South Delta. These tangled interactions suggest that salmon populations throughout California rely on Sacramento hatchery releases – anything that negatively affects the survival of juvenile hatchery-origin fish from the Sacramento Basin could ultimately affect the survival of the entire Central Valley fall-run population.